Just a quick word of thanks, as we all continue recovering from a West Seattle Community Garage Sale Day that was far sunnier than we expected (among other attributes) … thanks for being part of it, thanks for sharing photos, updates, and thanks for taking the time to meet your neighbors from far and near who stopped by. Next year’s WSCGSD will be the second Saturday as usual, which means it’s May 12, 2018! 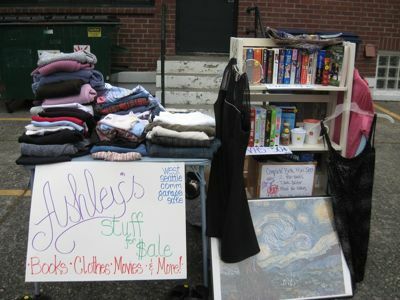 Alki Elementary is partnering with Clothes for the Cause for a Clothing Drive Fundraiser on the weekend of the West Seattle community garage sale. Donations will benefit Alki Elementary to purchase Emergency Preparedness Kits and supplies for the students of Alki. The Clothes for the Cause trailer will be at Alki Elementary School (3010 59th Ave SW) in the staff parking lot behind the school (south side of the school) on Saturday, May 13th and Sunday, May 14th. Bring the bags to us at your convenience on those days or text 206-954-0828 to arrange pick-up that weekend. The West Seattle Senior Center’s Stop ‘n Shop would be thrilled to take your unsold garage sale merchandise after the sale day has ended. We’ll be staying open late until 6:00 pm and will have extra helpers ready to unload your vehicle from our back alley. Your unsold merchandise pays for many great programs and benefits for our wonderful local senior population. Thank you in advance! The alley is off the south side of SW Oregon just east of California SW.
One of the easiest ways to motivate students to read and learn is to have books with topics that kids are excited about reading and learning from! Your donated books will make a difference! Over the past three years, West Seattle schools received more than 5,000 books for motivating and exciting students as an important part of education. We will donate religious-theme books to religious schools in West Seattle, and elderly books to Providence. We don’t want violent or sexual-themed books. West Seattle Community Garage Sale Day is a tremendous source of books. We are asking people who have left-over books from their yard sale this May 13th (as well as anyone who has excess books), to please donate your books to West Seattle schools. And for those who donated in the past, Thank you! You can drop off books at any of these locations through May 26th. 1. We will have a truck marked with a large sign “Donate Books to West Seattle Schools” in the West Seattle Junction near the Northwest Center truck (off 44th SW between Alaska and Edmunds) from 2 to 6 PM on May 13th only. Note: We will have 40 coupons good for up to 4 free Bowling Games at Roxbury Lanes for anyone who donates 20 or more hard-cover books. 2. Roxbury Bowling Lanes, 2823 SW Roxbury, 206-935-7400, from 11 AM to 7 PM. … Note: Roxbury Lanes, as part of its support for the Seattle community, will give a certificate good for 4 free bowling games for any book donation over 20 hardcover books. 3. Hotwire Online Coffeehouse, 4410 California Avenue SW … Note: Hotwire Coffee, as part of its support for the West Seattle community, will give a certificate good for $1 off any purchase at Hotwire to the first 25 people who drop off 10 or more hardcover books. We want to thank Denny Principal Jeff Clark, Denny Librarian Jeff Treistman, and Dearborn Librarian Craig Seasholes (formerly at Sanislo Elem) for their efforts to distribute books to their students. For further info, call Mr. Potratz at 932-3007. Thanks for being part of West Seattle Community Garage Sale Day 2016! Once again this year, we can wrap up WSCGSD with a participant-made time lapse … in this case, Sale #59, a carport sale in Fauntleroy. We hope you had some fun, despite the rain, the first time we’ve had a drop of precipitation on WSCGSD since our first year presenting it, 2008, when a shower moved through around 8 am and then made way for dryness. Guess the odds were going to catch up sooner or later. See our as-it-happened coverage here on WSB … and mark your calendar for May 13, 2017, second Saturday in May, as always, with registration opening in early April and lasting most of the month. Thank you for a spectacular 2015 WSCGSD! West Seattle Garage Sale 2015 from Danny McMillin on Vimeo. Now just TWO days to West Seattle Community Garage Sale Day 2015! Sunshine is still in the forecast – warm, too (high in the upper 70s) – so our tradition of perfect garage-saling weather continues. If you are somehow just finding out about this, Saturday, May 9th, is the day, 9 am-3 pm, 340+ sales of all sizes all over West Seattle! Both the online map and printable map can be found here. Later today – block sales/multi-seller sites! Also – for sellers and for people who might want the fun of shopping AND the fun of donation – our page listing “who’s accepting leftovers/donations” is now up and running. Wide array this time – dropoff, pickup, some open Sunday and beyond. P.S. Any last-minute cancellations will be noted on the online map, and we will mention the sale #’s here too so that if you have printed out the downloadable version, you can scratch them off. So far, only two since the downloadable version went live – the online map is updated but for the printed version, please scratch out #42 and #219. Is your sale signed up? Or – got your shopping bags ready? West Seattle Community Garage Sale Day 2015 is just THREE WEEKS AWAY, coming up Saturday, May 9th, 9 am-3 pm, and more than 180 sales are registered. Deadline to sign up, if you’re having a sale, is this Thursday (April 23rd) – so go here when you’re ready. Thanks! 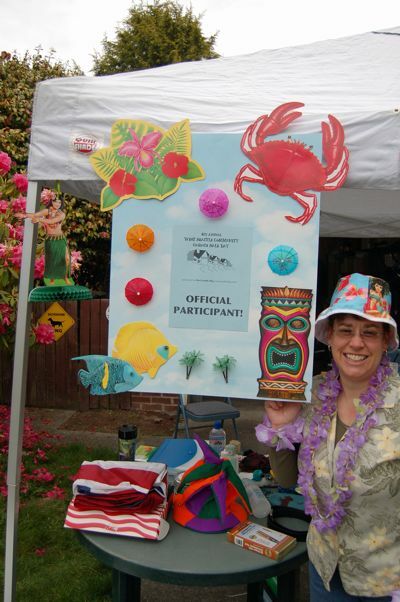 West Seattle Community Garage Sale Day 2014: What a day! Next WSCGSD – May 9, 2015. From time to time inbetween sale days, we’ll update this page with info on other sale days (Greenwood has theirs next Saturday, May 17th, for example). We’ll also be checking in the week ahead to see how generous sellers and shoppers were with their post-sale donations. Thanks again! During and after the West Seattle Community Garage Sale Day, the West Seattle Senior Center’s Stop n Shop Thrift store will be taking donations of any unwanted and unsold garage sale merchandise during extended business hours of 10-7 pm. The Stop n Shop Thrift shop will have extra volunteers on staff to help you unload your unsold items so you don’t have to drag them back into your homes! All proceeds from donated items help to fund the Senior Center’s many wonderful programs and opportunities for our local seniors. Please consider us before you put all that unwanted stuff back into your garage. Just pull up out front or back, we’ll do all the rest. Thank you! Out back would be the alley running south of Oregon between California and 42nd. Also, the WS Baby operations center in White Center will be open until 6 pm to receive donations, 10027 14th Ave SW. Details: We’d love your gently used newborn – size 12 children’s clothing and baby equipment like car seats, strollers, high chairs, portable cribs. For a complete list of items we accept, go to Programs and Services. NORTHWEST CENTER: Their regular dropoff spot in The Junction will be open later, till 6:30 pm, on sale day (Saturday, May 11th, only). Along SW Edmunds between California SW and 44th SW, parking lot south of Chase Bank drive-through. Here’s what they are accepting; if you’d like to schedule a Big Blue Truck pickup next week or beyond, here’s the information on that. STOP N SHOP @ WEST SEATTLE SENIOR CENTER: Staying open until 7 pm on sale day (Saturday, May 11th, only) to accept donated items. 4504 California SW. Here’s a list of what Stop ‘n’ Shop is looking for. West Seattle garage sale participants, are you interested in donating books to West Seattle public schools? Motivating and exciting students is an important part of education at Denny International Middle School and the other schools in West Seattle. One of the easiest ways to motivate students to read is to have books they are excited about reading. We are seeking donated books to help us to match each student to many appropriately-leveled high-interest books. Your book donation would help us with our efforts. You can drop off books at any of three locations. Note: Roxbury Lanes, as part of its support for the Seattle community, will give a certificate good for two people for two free games of bowling for any book donation over 20 books. 2. Hotwire Coffee – 4410 California Avenue SE, any time during open hours thru May 15th. Note: Hotwire coffee, as part of its support for the West Seattle community, will give a certificate good for $1 off any purchase at Hot Wire to the first 25 people who drop off 10 or more books. from 7:00 AM to 3:00 PM Monday to Friday, thru May 17th. Some books may be more suitable for older or younger readers. We plan to sort the donated books and find appropriate places for them, including local elementary schools, Chief Sealth International High School, and the West Seattle Senior Center. Thank you very much for considering book donation to help the scholars of West Seattle Schools! We are also always looking for other ideas to encourage educational development. Please email your ideas to the person who developed this idea, jpotratz2@aol.com Thanks! Got Garage Sale Leftovers? Bring your items to raise money for Arbor Heights Elementary! Please consider donating your garage sale leftovers to ARBOR HEIGHTS ELEMENTARY SCHOOL on JUNE 1 at the Annual Spring Carnival (3-6 pm). The school is doing a drive for all gently used clothing, and household items and even small furniture under 50 pounds will be accepted. The school will receive 10 cents per pound for these donations. Please come on by — the school is located at 3701 SW 104th St and enjoy the Carnival while doing something fantastic for your community! WSCGSD 2010, the aftermath: Picture of the day? 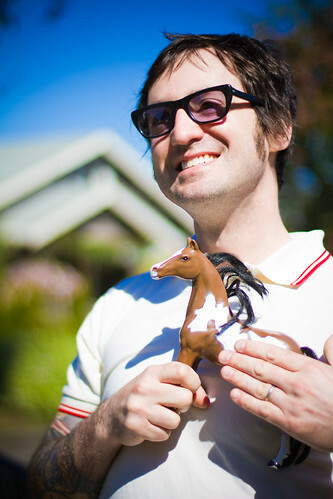 A shopper, photographed by a seller. Thanks to everybody for the feedback, constructive as well as complimentary … this was our third year of presenting/coordinating West Seattle Community Garage Sale Day, after founding organization Megawatt created it and carried it through the first three years, and we tweak it a bit every year. Hoping to find a better way to make the map next time around, to ensure nobody ever gets clipped from the westernmost shores of West Seattle to the easternmost slopes … also wondering if the second Saturday is the best day … it’s conflicted with Seattle Maritime Day every year … maybe the third Saturday is better? Any thoughts, leave comments, and thanks again for being a shopper, seller, reader, whatever. WSCGSD 2010, the aftermath: 1 man, 52 sales! And … it’s a wrap! Stand by for some aftermath info, including a reminder about places you can donate unsold items. Thanks again for participating in WSCGSD ’09! The prize judging slid a bit – OK, a lot – and we’ll be announcing that shortly. Meanwhile, hope you have marked your calendar for next year: May 8, 2010. Comments? Ideas? 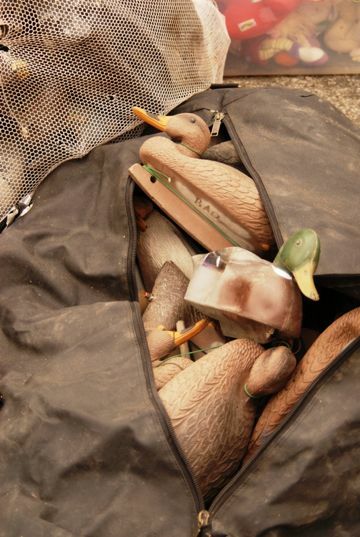 Open thread of sorts here – plus we’re opening this post to add some aftermath items such as, “found” items we’ve just heard about — for starters, here’s information about some keys that were found. Also, a box with money and kids’ sunglasses. What to do with after-garage-sale stuff? – Why not visit Northwest Center’s West Seattle Donation Drop Off? NWC will be extending hours on Saturday, May 9th until 6:30 pm. “The Big Blue Truck” is located in the Junction at the corner of 44th Ave SW and SW Edmunds, across from Uptown Espresso in the Diamond Parking Lot. Regular hours are Friday – Sunday 9 am – 5 pm. For a listing of acceptable donations visit their website at www.bigbluetruck.org. Please bag and box your items for the attendant. If you are interested in scheduling a pickup for the next week after the sale, click on “schedule a pickup” to enter your information. You will be contacted to schedule. If you’re among the 180-plus sellers signed up for WSCGSD, you’ll get more Northwest Center info in the packet we’ll be mailing you at week’s end. Mass-yard-sale withdrawal? Check out the first-ever Capitol Hill Garage Sale Day on June 14, sponsored by Capitol Hill Seattle. Ashley, who joined other sellers in the Hotwire courtyard, was the only person to enter BOTH contests; we have a Hotwire coffee card for her too. The photo shows her beautifully lettered sign (her candidate for “Most Unusual Item” was betta-fish tanks she offered for sale). Congratulations to all (we’ll e-mail the winners to make arrangements for delivering prizes); thanks to Hotwire, Illusions, and Body Bar for donating the prizes; thanks to everyone who was part of West Seattle Community Garage Sale Day; stand by for an online survey we’ll be setting up within a few days, and mark your calendar for the 5th annual WSCGSD on May 9, 2009! house for a needy family. will truly be a life-changing experience for these kids. 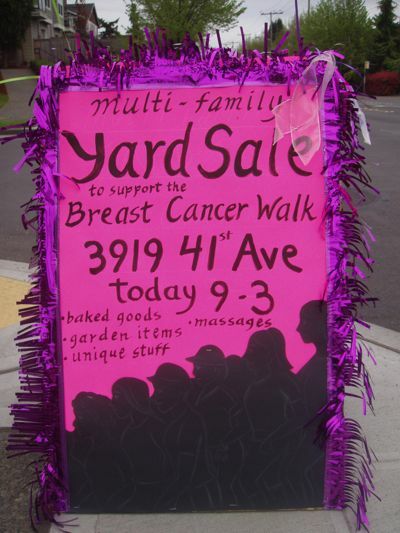 *This site will stay up in the interim as an archive of 2008 West Seattle Community Garage Sale Day, till it’s time after the first of the year to rev it up for 2009, at which time we’ll freshen some of the pages. The 4th annual West Seattle Community Garage Sale Day is in the rear-view mirror – and so far sounds like a pretty good time was had by all (or at least, most!). We’ve got an open thread for comments over at West Seattle Blog. Meantime, if you are a seller with leftover items to donate, please refer to the materials that came in your postal-mail packet for instructions on how to book a pickup with Northwest Center – or remember, their donation location in The Junction (northeast corner of 44th/Edmunds, next to the WaMu drive-thru) is open till 6:30 tonight!